I need to address how terribly weird and indecisive Koreans are about what whets their appetite. Let’s be clear about one thing: I love the combination of sweet and salty and sour and sweet but these folks have it all mixed up. What do I need to do get a plain fried egg around here? Go to a fancy hotel and get in line at a gross buffet? All the restaurants that serve “brunch” fare around here serve their one or two egg options with a sauce that is made up of one of two ingredients – cheese whiz with ranch sauce and or ketchup based salsa. At one restaurant, when I asked the owner what his “English Egg” dish came with, he said it came with his “secret sauce” on top of the fried egg. When I asked if I could have the egg plain on an English muffin, he looked at me as if I had asked him some outrageous question and then proceeded to kindly explain that “in Korea, people don’t just eat a fried egg.” I wanted to tell him that there was nothing “secret” about his “secret sauce” and wanted to unleash some K-rage but decided to politely ask for a side of plain roasted potatoes. I’ve heard Koreans are considered the “Irish of the East” and maybe that’s true. Lots of potatoes on menus. Guess what the potatoes were served with? A side of gross ketchup based salsa. This was my 12th attempt since arriving in Korea to get a plain fried egg. And what is this? Tteokbokki is a rice cake dish that is served typically spicy with lots of gochujang. They made this into a snack? Spicy and sweet. 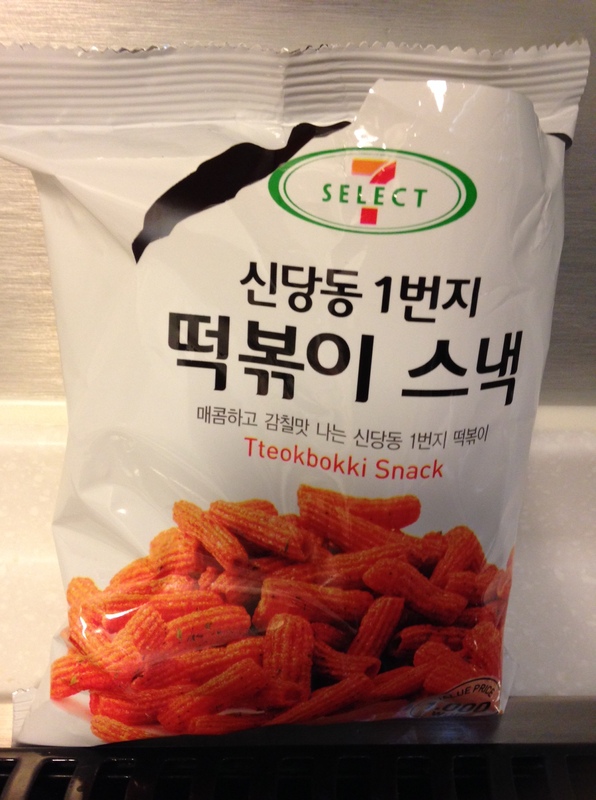 I just had to try it and I could see how this might appeal to Koreans but it is a truly bizarre snack. I would actually describe it as a “schizophrenic” snack. It’s like you can’t make up what you want to taste – spicy, sweet, salty, starchy?